Yes, you should use trekking poles! Because of the flat terrain, we are often asked whether trekking poles are needed on the Florida Trail. After all, trekking poles are only for going up and down mountains, right? Well, there are tall sandy hills in central Florida, the remnants of ancient beach dunes. Climbing the loose sand with a pack invites twisting and rolling ankles, so trekking poles are useful there. In the Big Cypress and Bradwell Bay Wilderness swamps, trekking poles let you probe the trail in front of you for submerged logs, holes, et cetera. At common flooding points like along the Suwanee River, you can probe the water depth before taking the plunge. On dry land they help prevent falls if you trip on a root, and besides, everyone who has used poles knows how much they improve balance and turn you into a four-legged animal. They're beneficial in any terrain. 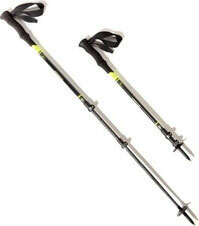 There are some very cheap and very expensive trekking poles out there. Swiss Gear, Outdoor Products, and Sierra Mountain Gear offer poles for $15 - $40 a pair, while some Leki and Black Diamond models sell for $200 a pair. That's a huge price range for products with basically identical features. If you're not familiar with the differences between poles, this very thorough overview of trekking pole features and types from REI will familiarize you. A company's marketing will often emphasize pole weight, but there is virtually no weight difference between aluminum and carbon fiber poles. Our comparison of the most expensive poles at one online retailer with the cheapest found the $200 carbon fiber model weighed just 3 ounces less than the $65 dollar aluminum model. Our position is to place the overall quality and hence longevity of the pole first and foremost — the tips and their attachment to the rest of the pole in particular — and ignore weight. The tips on Swiss Gear, Outdoor Products, and Sierra Mountain Gear poles wear down to nubs and get pushed up into the pole shaft relatively quickly (on a thru-hike) while the tips on Leki, Black Diamond, and even REI poles can last over multiple thru-hikes. After 2400 miles, the tips on our pair of REI poles have worn so little they look brand new. 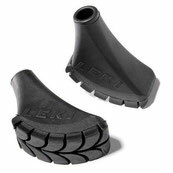 Our advice then is to get a pair from Leki, Black Diamond or REI, but stick with the mid-priced models. Along a roadwalk or paved bicycle path your trekking poles become useless without rubber walking tips. You end up holding them in one hand or strapping them to your pack. With 300 miles of roadwalks on the FT and an undetermined number of paved bicycle segments (possibly 75 miles by our rough estimate), we recommend getting a pair of rubber walking tips, that way you continue to benefit from the poles and they don't become extra weight on your back.